Last week Shikamaru was watching Naho Saenoko from Corpse Party. Shikamaru's stuck on guard duty indoors during a gathering of characters so instead of cloud watching he's turned to shadow watching. If you can tell Shikamaru the name of this character and the series they come from you'll be rewarded with four random cards. This round closes on Thursday, January 22nd. ☆ This round, every play valid play featuring a green or gray card will receive an additional random card. This round closes on January 22nd. ☆ This round, every play valid play featuring a card that starts or ends with the letter a will receive an additional random card. This round closes on Thursday, October 9th. This round is now closed. 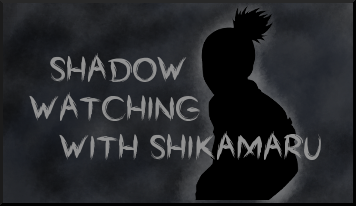 Last week Shikamaru is a mystery until Monday. This round closes on Thursday, October 9nd. You can earn up to a total of 75 random cards and three random crayon for completing the tasks for this month, not counting possible bonuses! Completing all the tasks will earn you an additional 10 random cards, 2 random crayons and the GRAND PRIZE! Wadanohara had a list of deliveries to make, but before she could even get started, a spell went awry and mixed the all the letters up! Do you think you can you help her put them back in the right order? For each name that you unscramble, she'll give you one random card as a thank you! If you can get them all right, she'll give you an additional random crayon. This round will close on Monday, October 6th. ☆ This round, every play valid play featuring a character with a confused, surprised or generally wtf expression will receive an additional random card. This round closes on Thursday, October 2nd. This round is now closed. ☆ This round, every play valid play will receive an additional random card! This round closes on Monday, September 29th, but the next round will go up on Thursday as usual! This round is now closed. Last week Shikamaru was watching Czeslaw Meyer from Baccano! This round closes on Monday, September 29th, but the new round will go up on Thursday as usual. This round is now closed. Do you think you can you help her put them back in the right order? For each name that you unscramble, she'll give you one random card as a thank you! This round will close on Monday, September 29th. This round is now closed. The solution to the previous round can be seen here. Kanji's Quilting is an puzzle game logic-based, color-placement puzzle based off of the popular Sudoku using colors instead of numbers! The rules are simple: the can only be one color per 3x3 box, row and column contain one of each color. Additionally, although you are filling in colors, each number can also be associated with a number. Last week Mama was watching Mogeko Castle. This week, Mama was treated to a bento box to a high schooler after forgetting her lunch at home! It seems that between her height scaring other students and ugly rumors spreading around, she's been having a hard time fitting in. Fortunately, Mama knows better than to judge people so easily and the two were able to hit it off and even exchange cooking tips! Can you tell Mama the name of the character that made this bento? Tell her, and she says she'll give you a bento box and two cards for dessert! This round will close on Monday, September 23rd. This round is now closed. This round will close on Monday, September 15th. This round is now closed. Last week Mama was watching Yuru Yuri. Can you tell Mama the name of the game that this prosciutto is from? Tell her, and she says she'll give some prosciutto and two cards for dessert! This round will close on Monday, September 22nd. This round is now closed. Sorry for the delay in getting these up! I had to deal with some personal drama this week. This round closes on Thursday, September 11th. This round is now closed. Last week Shikamaru was watching Efina from LiEat. This round will close on Monday, September 8th. This round is now closed.